I really disliked Pushing Ice, the last Reynolds' novel I read before this one. Nothing in that book rang true to me: characters, plot or action. As a result, I own that I may have been harsher in my reviews of Galactic North Tales from the Revelation Space Universe] and [b:The Six Directions of Space than they deserved. I was afraid that one of my favorite SF authors was "losing it." It is with relief then that I can say that "my" Alastair is back. The Prefect is a well paced, intelligent adventure with an interesting hero in the titular prefect, Tom Dreyfus. For the uninitiated, the action takes place in Reynolds' Revelation Space (RS) universe introduced in the novel of the same name but about a century before the Melding Plague brings down Demarchist civilization and turns the Glitter Band into the Rust Belt (the so-called Belle Epoque). The setting reminds me of pre-Great War Europe: humanity is enjoying a Golden Age when everything seems possible and there's no notion how precarious human existence is. The story revolves around Dreyfus, who stumbles onto a systemwide plot to subvert the democratic order while he's investigating the massacre of an orbiting habitat. There's a subplot involving his deputy, Thalia Ng, but it closely parallels and supports the central narrative, offering little distraction and not slowing things down. Demarchists "Democratic anarchists" Largely baseline humans, though they use minimal implants and some societies have gone far in physical modifications (gills, adapted to low G, that sort of thing). Ultras Starship (lighthugger) crews. Often heavily modified to survive the rigors of interstellar space, they nevertheless are still recognizably "human" in psychology and social organizations. Conjoiners The most alien offshoot of humanity, they've become something of a hive mind, though a strong individuality is retained, and they fought a vicious war with proto-Demarchists before fleeing the Solar System (these early days are recounted in a couple of stories in Galactic North). 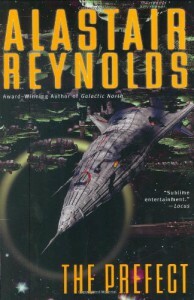 It's the future history that I enjoy most about Reynolds work. Dreyfus is actually the most memorable and interesting character he's created IMO but I've got a weakness for Sherlock Holmes/Judge Dee types. RS is a well conceived, interesting and complex future history based on plausible extrapolations of science. (Outside of Iain Banks' Culture, the Conjoiners are number two on my list of future civilizations I'd like to join.) The only "problem" I have with it is its bleakness - we learn in "Galactic North" that by AD 40,000 the Greenfly infestation has chased humanity out of the galaxy. Recommended? Yes, with reservations. If you don't want to read the previous books (and aren't afraid of spoilers), check out the Wikipedia entries to get up to speed (starting with http://en.wikipedia.org/wiki/Revelation_Space_universe). Otherwise, start with Revelation Space Revelation Space Book 1 and read the series in order. You won't be disappointed.